Budget forecasts revealed that this “simplification” of the tax system stood to raise £3.3bn. (Those few who were, sober, at the CIOT dinner last week will remember the warning to beware Chancellors bearing tax simplification gifts). But, quietly, this tax year the general personal allowance caught up with the age related personal allowance for over 65s (£10,500). Next year, assuming the Conservatives press ahead with their manifesto pledge to raise personal allowances to £12,500 over the life of the Parliament, it will catch up with that for over 75s (£10,660). And that bit of the income tax code that we call “income tax” will discriminate less against the young on the grounds of their age. Less, because we will still have the “married couple’s allowance” – worth between £322 and £835 a year – and one or two other quirks. So someone above state pension age earning £50,000 per annum would take home £40,596 whereas someone below state pension age would take home £36,325 per annum. Can this difference be justified? Certainly not on the ground that National Insurance Contributions are the means by which you pay for your state pension so that once you’ve paid for it you can stop contributing. 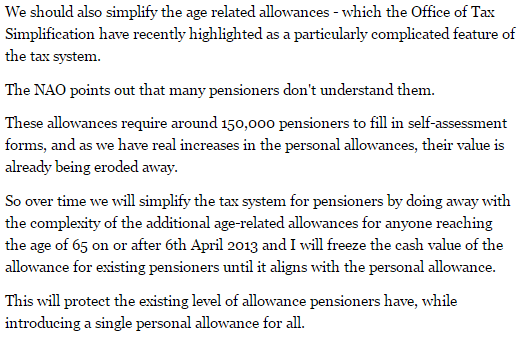 True it is that to receive the full basic state pension you have to pay NICs for 30 years. But NICs don’t fund the state pension; paying them for more than 30 years doesn’t increase your entitlement; and nor does paying more of them during those 30 years. Moreover, the employed can pay, retrospectively, for missed years for £14.10 a week – and the self-employed for £2.80 a week. If logic does not dictate that you stop once you’ve qualified, why should it dictate that you stop once you hit state pension age? It can’t be justified, either, on the grounds that it is necessary to equalise post-tax incomes between generations. 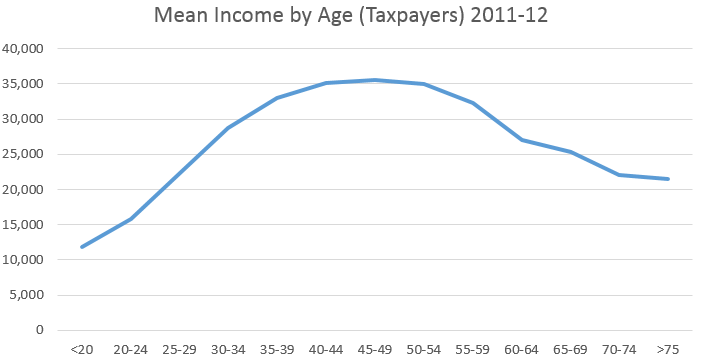 As the chart below reveals (drawn from this data), different levels of taxation merely exacerbate the income advantage enjoyed by the old over the young. Other potential justifications? I am fresh out, I am afraid. Following the Chancellor’s 2012 announcement there was a little pecking at his liver. Ros Altmann, then Director General of Saga but now Baroness Altmann of Tottenham and Pensions Minister, described freezing age-related pensions announcements as an ‘outrageous assault on decent middle-class pensioners’. But, as this chart from Liam Byrne via House of Commons Library/IPSOS MORI shows, the Government escaped meaningful punishment. A further good deed the Chancellor might do on 8 July would be to abolish the NICs exemption for those above the state pension age. Or he might – as with the married couples allowance – restrict future entitlement to it to those presently entitled to it: if you don’t get it now, you won’t get it in the future. That would be an undoubted good deed. And, like the Granny Tax, it’s early enough in the electoral cycle for it to go unpunished. [I have edited this piece to remove a speculation as to the potential cost of such a measure]. Your proposition that pensioners should continue to pay NIC after they have acquired access to their State pension entitlement is unreasonable. It is accepted that all persons who become entitled to the State pension have not all paid the same amount of NIC but that is no justification for your proposition that NIC should continue to be charged after an individual has become entitled to the fruits of what he has contributed to over 30 years. The nature of insurance is that the strong carry the weak.So yes someone who earns £50,000 on average per annum for 30 years will pay considerably more that someone whose average annual earnings were £25,000.Even people who earn the same cumulative amount may have paid different amounts of NIC in total, depending on the rates applicable in different tax years. It is called “community rating”.Get over it. They already do continue to pay NICs after they have become entitled to the state pension. And I should add that you don’t ‘contribute to’ some fund from which the state pension is paid. It is paid from borrowings. It’s one argument to say that as you don’t stop paying NIC once you’ver paid 30 years’ contribution so why should you stop when you reach state retirenment age. It’s another argument to say why should you carry on paying NIC once you’ve paid 30 years’ contributions. I prefer the second argument. I don’t see that the unfairness of having to carry on paying NIC after you’ve paid the full 30 years required can be used as an argument to be asked to carry on paying it even after you’ve reached state retirement age. (you’re getting nothing for it so you may as well carry on getting nothing for it even longer). If there is a lack of logic that needs rectifying, employee NIC should stop once 30 years’ contributions have been reached (it is of course a coincidence that I am arguing this and have 31 contribution years). Mind you, the whole thing is a mish-mash anyway. After all, with the primary threshold set above the LEL there is the absurdity of someone who (currently) earns (say) £7,800 a year who will be paying no employee NIC yet being credited with a contribution year. There used to be the sop for those paying (much) more NIC that they would get (slightly) more state pension. That was at least some comfort but now that has been taken away too. If you were calling for a merging of NIC & income tax there would at least be a consistency. But to hold out NIC as being the money you pay (in part) to earn your state pension and then expect people who have being paying tax and NI for maybe 40 years to carry on paying NIC after they have retired seems……….ungrateful? In what sense have I said that NICs are “contributions” to the state pension? Or as being “the money you pay (in part) to earn your state pension”? They’re not: I’m explicit that I regard them as just another type of income tax – and one that it is unfair that some high earners should be exempt from paying. I think that you have still over stated the potential revenue raised by a material amount. There are a number of reasons for this but the main one relates to the definition of a pensioner “unit”. This is one where there are two people, married or co-habiting and one of whom is over the state pension age. As there is quite a lot of difference between the state pension age for men and women, there must be a good chance that a lot of the NIC you think would be saved has already been paid. This is especially the case if you look at the weekly averages and compare them to a typical wage. Also, you assume that all the amounts are earned by only one of the couple whereas there must be a good chance that both partners work. In which case there would be two lots of primary thresholds to think about. And your link number  links to the wrong documents. As I understand it, National Insurance was a fixed-rate “stamp” for its first 60-some years. For about half of that time, most people paying NI were not paying income tax (as late as 1938, there were fewer than 4 million people paying any income tax at all, about a tenth of the population). The NI “contribution” only became earnings-related in 1975. It was originally linked to contributory benefits, there is little sense in which NICs actually “pay for” anything these days, although that perception lingers on (as does the idea of “paying your stamp” each week, and “getting your cards” when you are dismissed). Nowadays, it is just another income tax. As such, it is hard to see why those aged 16-65 should pay more tax than the old or the very young on the same income, or why there is more tax on employment income than on the same amount of savings income (doubly so when you add on the payroll tax payable by employers, in the form of secondary Class 1 NICs). NICs also account for much of the tax distortion between income derived from different forms of business structure (employment salary, partnership drawings, and dividends on shares). I can think if two main two reasons to keep NICs as a separate tax, both largely political: first, people don’t seem to mind NICs as much as income tax (another penny for the NHS, etc) and, second, other countries levy social security contributions, so why shouldn’t we. You can probably take from my footnote 2 that I was aware of the definition of pensioner units. Your first point could have some temporary effect on the NICs foregone from younger pensioners – but I wouldn’t overstate it given that men’s ‘retirement’ age is higher, they are likely to be the main breadwinners, and (anecdotally) couples may often retire together. As to your second point, the prospect of two pensioners working is actually quite small (less than 3%) as can be seen from the fact that only 17% of any pensioners have income from employment at all. So the effect will be very modest. Standing back, you can probably see from the careful way I put the estimate that I agree £3.1bn is not a hugely secure number – but I don’t think I would agree (if this is what you are implying) that it is substantially out. Thanks. I agree – and have dealt with some of the oddities that having two income taxes throws up here. Unfortunately anecdotes are not really helpful in an evidenced based world. You say “but I don’t think I would agree … that it is substantially out”. I will call your bluff on that. But before I do, let me just make one thing clear. I don’t have any objection to the change you propose. I just think that you are massively over-stating the revenue that could be raised. – When the woman is over the state pension age but the man isn’t, over £400pw is earnings. 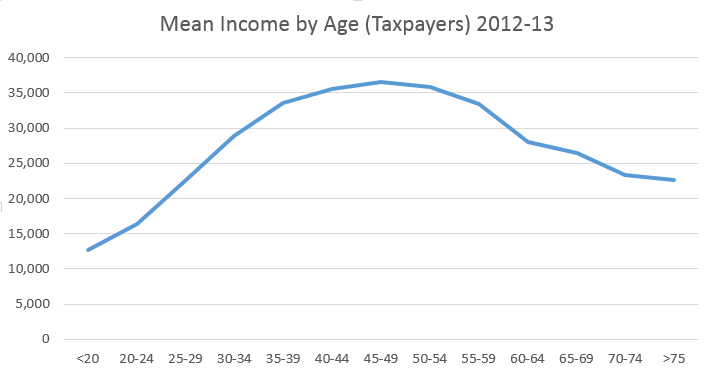 By coincidence (or not) that is very close to median income before tax for 60 to 65s. – When it is the other way around then it is a bit less than £400 per week. Notwithstanding your anecdote, these two points (and the next one) suggest that the income in these families is predominantly the earnings of the younger partner. Now there will always be differences. – This contrast with £61pw if the post-2018 regime assumption is used that both are over the state pension age. This suggests that once both partners are above state pension age their earnings falls substantially. In fact, below the primary threshold. Now averages do hide a lot of things. There will be pensioners earning millions. But to me the £61pw post-2018 number is the killer. It makes it very difficult to see how the revenue raised could be anywhere near £3bn. To make this increase more palatable it could perhaps be done in conjunction with the alignment of the NI and IT starting points (to ensure that very low earning pensioners did not begin to pay NI). Regardless, this alignment is surely something that Labour should focus on in the current parliament – unlike most other tax/benefit changes it is difficult to see how this could be opposed by the left, right or middle (other than on grounds of short term affordability). If Labour opposes benefit cuts, it will be opposed, including by many of its own supporters; if it proposes tax increases, again many will oppose it. So campaigning to increase the NI starting point to ensure that the lowest paid working age, working people do not pay national insurance should be an all-round attractive policy for it. Particularly as the Conservatives would struggle to deliver by 2020.